The book provides a full complement of assessment technologies that enable leaders to measure and evaluate performance using qualitative and quantitative performance indicators and reference points in each of seven areas of organizational performance. While these technologies are not new, applying them in a comprehensive assessment of the performance of both academic and administrative organization in higher education is a true innovation. Assessing Organizational Performance in Higher Education defines four types of assessment user groups, each of which has unique interest in organizational performance. This offers a new perspective on who uses performance results and why they use them. These varied groups emphasize that assessment results must be tailored to fit the needs of specific groups, that “one-size-fits-all” does not apply in assessment. An assessment process must be robust and capable of delivering the right information at the right time to the right user group. Barbara A. Miller, Ph.D. (formerly Lembcke) is an organizational development consultant to colleges and universities, and serves on the faculty at DePauw University, Greencastle, Indiana. Previously Miller was senior policy and planning analyst at George Mason University, Fairfax, Virginia. The author served three years as an evaluator and examiner with the Malcolm Baldrige Quality Award Program and has served as an outside consultant. Tables, Figures, Exhibits, and Worksheets. Chapter 1: Purpose of Assessment. Chapter 2: Organizations as Systems: Internal Elements. Chapter 3: Organizations as Systems: External Elements. Chapter 4: Assessment Methods and Terminology. Chapter 5: Defining and Measuring Organizational Performance. Chapter 6: Creating and Maintaining Assessment Programs. 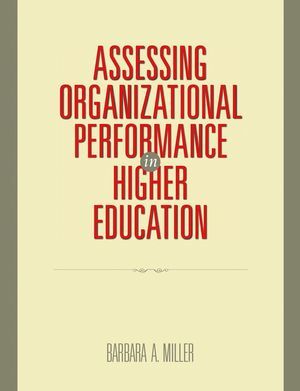 "The release of Assessing Organizational Performance in Higher Education by Barbara A. Miller could not be better timed in light of the need for greater accountability from public entities... Dr. Miller brings a wealth of experience, a depth of research, consultation at both private and public universities, and extensive knowledge of systems to each chapter of this publication.... Assessing Organizational Performance in Higher Education is a useful tool for those who are seeking meaningful ways to evaluate the effectiveness of their organization. In addition, graduate students and entry-level staff will find this a worthy primer to understanding the complexity of organizations and the necessity for measurement." -- Narbeth R. Emmanuel, Southern Illinois University Edwardsville, in Journal of College Student Development, September/October 2007.